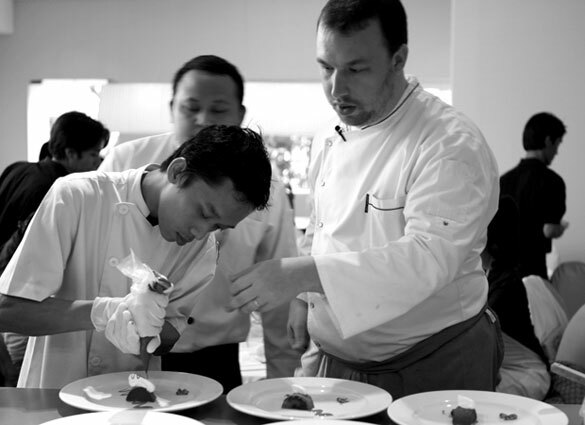 Few fine dining venues in Bali have distinguished themselves with such flair and inspiration as Ubud’s award-winning Mozaic Restaurant run by Chef Chris Salans. Chris was born in the U.S., but moved to France with his parents at age two. As a small boy, he used to sit at the kitchen counter watching his mother cook traditional French dishes. 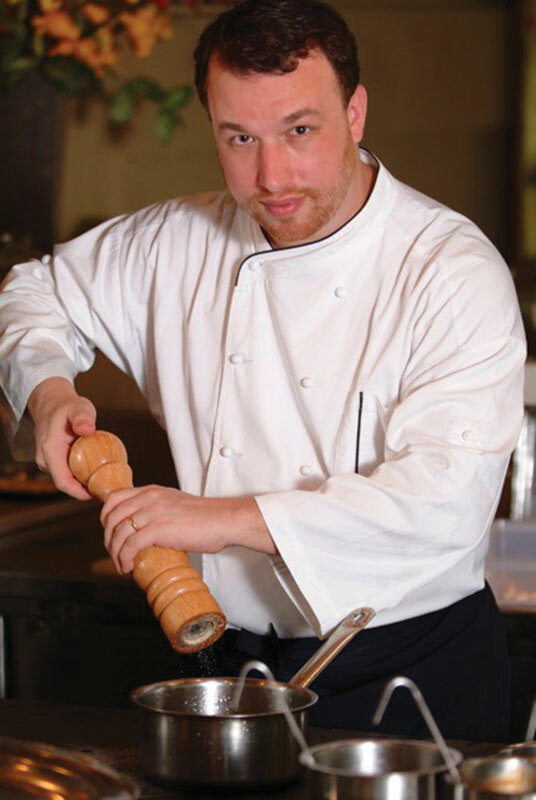 Chris returned to the U.S. for college, then went back to France to train at such prestigious restaurants as the l’Oustau de Baumaniere, Bouley’s Bakery and Louis Carton in Paris. Later in his career he worked as a chef at various David Bouley establishments in New York and at Thomas Keller’s French “Bouchon” bistro in California’s Napa Valley before discovering the secrets of Asian ingredients and opening the Mozaic in 2001. Ever since its acceptation as a member of the exclusive French culinary association Les Grandes Tables du Monde in 2004, the restaurant’s French-Asian fare, served in a 60-seat garden pavilion, has become a showcase for Chris’s du marche “market cooking” style, which takes prime in-season ingredients and incorporates them into a range of French dishes presented in high gastronomic style. 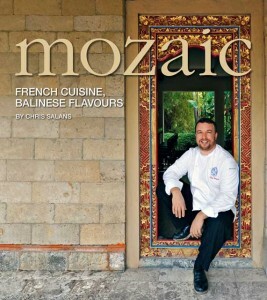 Chris’s new cookbook Mozaic: French Cuisine, Balinese Flavors was published by Editions Didier Millet in 2011. The inspiration comes from the fresh produce arriving daily at Mozaic, my walks through the night markets, my trips through the wilderness of Bali or just from eating out at local eateries where Indonesian flavours are the most genuine. Do you use any secret sauces or ingredients? I have only one secret: my passion for the ingredients and for excellence in food creation and service. I haven’t invented anything so there are no secrets. I think that each chef translates recipes or flavours the way he or she perceives them. I guess that many people like the way I portray the flavours. Does Mozaic serve what would be considered “health food”? What is your personal favourite on the menu? I can’t say I have a favourite. We change the menu daily depending on arrivals of fresh ingredients, so we have a long list of signature dishes. But I can definitely tell you, when it comes to Balinese tastes, my favourites are base gede, kecicang, kecombrang and belimbing buluh. There is no longer any mystery as to where to find imported ingredients. Bali now has a number of outstanding imported food outlets. For local ingredients, please go to the market in your area! Rediscover why you are in Bali, meet the people, see what fresh ingredients they have but you have to get there very early in the morning to get the freshest pick! I have been thinking about a book for a few years, but never had the time until I decided to finally sit down and work on it last year. There were so many factors to consider – which recipes and ingredients to include, writing down my recipes and making them easy to use at home, making sure the flow was interesting, choosing the right photos so that the dishes were represented properly. The book took over a year from initial planning until we went to press. It was all tough but in retrospect the whole exercise was very interesting. What was the most enjoyable part of working on the project? The satisfaction of having directed the team working on the book towards the goal I wanted to achieve. Every member – the writer, the photographer, the editor and the graphic artists – were key to making the book a success. Once I realized that the team achieved what I wanted, it was extremely satisfying and fulfilling. Are there recipes in your cookbook that are not found in Mozaic’s menu? Since we don’t have a fixed menu at the restaurant, you can say many of the recipes in the book are not found at Mozaic. They were at some point in time, and may reappear some day. It’s a menu in constant evolution, so who knows! In your mind, what is your cookbook’s greatest value? Helping readers discover beautiful new ingredients and giving them ideas on how to develop recipes for their enjoyment. Most cookbooks write about exiting traditional dishes, but I wanted to take the reader to another level. Instead of teaching the recipe for rendang, I prefer showing how to get that superb taste and include it in a dish which is western in allure, yet is reminiscent of rendang’s deep spices and richness. The dishes pictured in your book look very elegant and fancy. Are these recipes difficult to prepare in the home? You’ll see from the legend that some recipes are rated with one or two small forks. We chose that symbol to identify the recipe’s degree of difficulty. The one fork should be no great difficulty if you read the method instructions carefully. For recipes that are rated as more difficult, basically I would say that either a good knowledge of cooking techniques or a few practices of the recipes might be needed. In the end Mozaic’s cuisine is not simple to reproduce. If it were, then Mozaic would not be what it is today!